I have recently been working with Lendlease a large development company who have been working on large construction projects in London and the rest of the UK. This recent piece of illustration work was commissioned for their annual magazine to be distributed to all stakeholders to inform them about the work on The International Quarter project. The illustration would go to print on the front cover of the magazine. 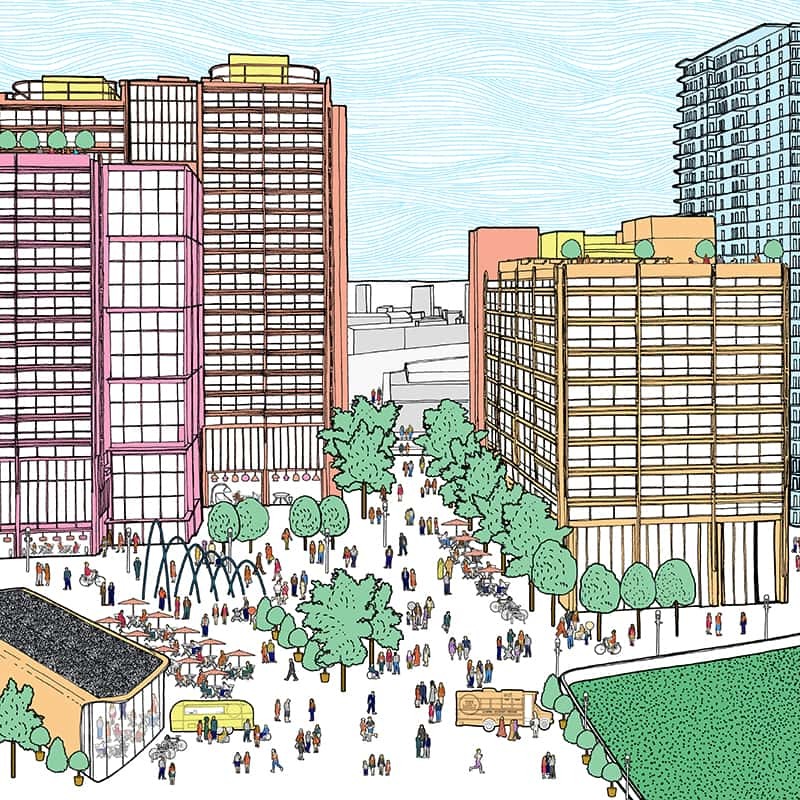 The drawing is based on a CGI render of the development of the Stratford, area which has undergone a massive development programme during and after the Olympic games, where Millions of pounds have been spent developing the area. The Illustration is a detailed drawing of the development as a representation to show the stakeholders, I illustrated the buildings according to the CGI render. this illustration has drawings of people, which in this instance was a requirement. The people I had referenced from glossy magazines and I drew them as simplified forms. The people drawings would be used on a small scale. I had introduced colour to the illustration at the client’s request, due to the illustration needing to be bright and colourful. There was a lot of attention to detail within this drawing, considering the detail of the buildings, the surrounding areas and the people, which was to show a representation to the stakeholders of how the communal social space would be used by people walking through it, eating and entertaining.